If you are using a GPS or maping service this address will likely not work. You can use the GPS cordinates: (36.943, -84.305) or click on the driving directions link below to print a map. Located just off 896 on LakeShore Dr.
From I-75 take exit 25W in Corbin, Kentucky; follow 25W to 90 turnoff to Cumberland Falls State Park. Pass through the Falls area crossing the river and continue about 4 miles to 896, turn right at Ron's Market. Follow 896 11 miles to Lake Shore Dr; turn left and follow to dead end. From Somerset, Kentucky, follow US27 south to Parkers Lake. 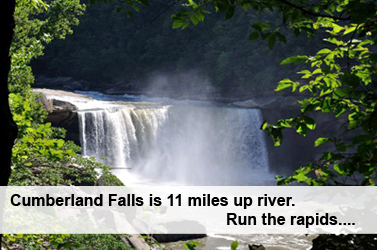 Turn left on 90 toward Cumberland Falls and Follow about 7 miles to 896, turn left at Ron's Market. Follow 896 11 miles to Lake Shore Dr; turn left and follow to dead end.